Emma brings heart and passion to charity events, immersing herself in the spirit of every occasion she attends, from award ceremonies to fundraising race nights. As a fun host for dinner games, raffles, auctions and ladies’ nights, she’s a true crowd pleaser who spends quality time with guests and works ‘off the cuff’ as each event demands. 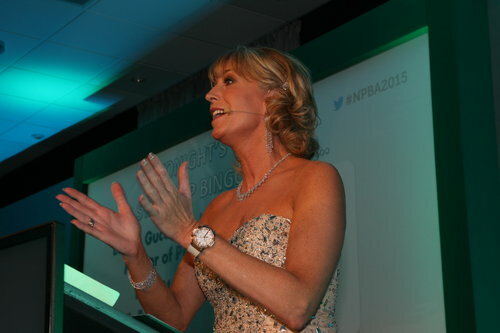 An experienced compère for black-tie balls, Emma is invited to host the Breast Cancer ‘Pink Ball’ every year. Planning a charity event? Looking for a host that goes the extra mile to make things special? Contact Emma and tell her how you’d like her to be involved. As a former vet student and animal lover, Emma cares deeply about animal welfare; is patron of the RSPCA’s ‘Safe Haven’ scheme and a proud representative of World Animal Day. Over the years, she’s had the privilege of taking part in media campaigns and sketches for well-known charities such as Comic Relief, Children In Need and the Samaritans, and was deeply honoured to appear alongside the partners of military personnel in a fundraising calendar for the Forces Children's Trust. If you think Emma could help you with a fundraising event — get in touch with your details. Looking to organise a Ladies Day at the Races?